Properties in Eglise Saint-Jacques average 4.7 out of 5 stars. Property 55: Family Holiday Hamlet - Heated Pools, Golf, Tennis, Creche, 10 mins to beach! Property 56: Family Holiday Hamlet - Heated Pools, Golf, Tennis, Creche, 10 mins to beach! Property 57: Family Holiday Hamlet - Heated Pools, Golf, Tennis, Creche, 10 mins to beach! Property 58: Private pool and secluded garden. Family friendly. Property 60: Family Holiday Hamlet - Heated Pools, Golf, Tennis, Creche, 10 mins to beach! Property 61: Family Holiday Hamlet - Heated Pools, Golf, Tennis, Creche, 10 mins to beach! Property 64: Moyen Cottage at Chez Maurit, 2 bedrooms, TENNIS court, superb views. 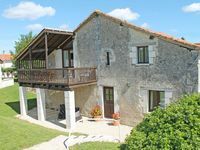 Property 65: Bas Cottage at Chez Maurit, 2 bedrooms, TENNIS court, superb views. Property 66: Jardin Cottage at Chez Maurit, 2 en-suite bedrooms, TENNIS court, superb views. Property 70: Family Holiday Hamlet - Heated Pools, Golf, Tennis, Creche, 10 mins to beach! Property 79: Family Holiday Hamlet - Heated Pools, Golf, Tennis, Creche, 10 mins to beach! Charming cottage for family and friends in the heart of a village in South Charente. Property 86: Charming cottage for family and friends in the heart of a village in South Charente. Renovated Cottage-Just outside the market town of Riberac. Property 89: Renovated Cottage-Just outside the market town of Riberac. Property 95: Family Holiday Hamlet - Heated Pools, Golf, Tennis, Creche, 10 mins to beach! 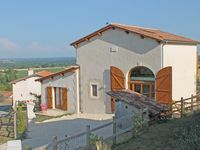 Two rural gites with stunning Swimming Pool in large open grounds. Property 96: Two rural gites with stunning Swimming Pool in large open grounds. We stayed at Pressoir de Pierre for a week in July. We loved the accommodation and will definitely come back to this house. It was wonderful to be able to open the doors and let the breeze go through the whole house, upstairs and down. The furnishings are lovely, very calm and serene. The views are stunning and we felt very relaxed during our stay here. The kitchen is well equipped with everything we needed and all very new in great condition. We enjoyed the short walk up and down to the tennis courts, pool and bar. We've always stayed in the houses down in the heart of longeveau but will definitely stay 'up the hill' again. Thank you Longeveau for another lovely holiday! We could've easily stayed a whole month longer. Rolling countryside, wine, cheese, frogs and peace!